I could really make use of a newer version (5.3.2 has a bug that affects Mediawiki), how did you get that installed? Note: My httpd.conf was blank from fresh install so don’t be alarmed. This should be added to the original post, because it’s required every time. apache isn’t configured to be used with phpmyadmin by default. Thank you! Most other blogs omit this step. I agree with tenleft… your solution is correct and works perfectly. Thank you hub for supporting and helping others 😉 +Up your post. thanks… finally something which worked. other blogs ommited `php5-mysql` installation instruction, that caused php not working with mysql… thanks a lot… this should be the instruction given on ubuntu’s website… but even they dont know what to install on their own OS…. Happens when you use a search engine instead of the official documentation. I could not copy the phpinfo.php into the varwww directory. After installing everything I tried to open phpmyadmin. It was asking for the username and pass word. I know the pass word which I assigned during installation. But what is the username? I tried admin, admn,.. It is not working . any help? I followed all the instructions and everything worked,until the install of phpmyadmin,after which I got a “404”,but after adding the “include….” line to and saving the Apache2.conf. file and trying again it worked!I then logged in as “root” + the mysql password I’d already set up!Now,I’ve got some heavy learning to do! This installs everything (phpmyadmin depends on apache & php).. I am new to both MySQL and PHP as well as linux.I have installed LAMP as the steps provided by you but PHP is not at all working. 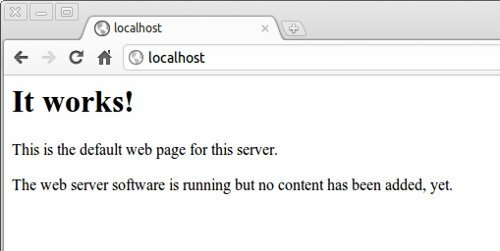 after restarting apache2 and writing of code for phpinfo, i didn’t get the phpinfo page. And any other files like .html or .txt in web directory (/var/www) are not avalaible on this server. This servser shows no content at all. Please provide me with solution.